*EXCLUSIVE OFFER - Extraordinary days! Stay with us between 15 February – 12 April 2019 and benefit from a 20% Discount! 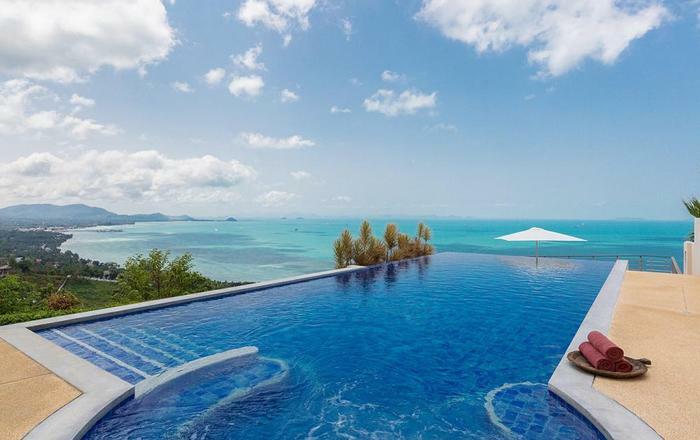 Escape to your very own tropical paradise at this beautiful 5-bedroom Koh Samui (sleeps 10), offering direct access to Maenam Beach on the island's north shore. Relaxation here comes easy, with a sparkling infinity pool, beachfront sala for al fresco dining, a sprawling living space with vaulted ceilings, and gorgeous bedrooms with ocean views. 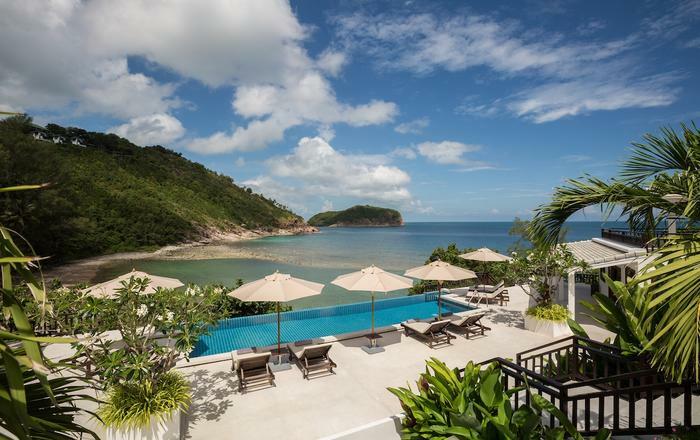 An in-villa Thai chef, access to sea kayaks, and a year-round swimming beach add more delights to this blissful island getaway. 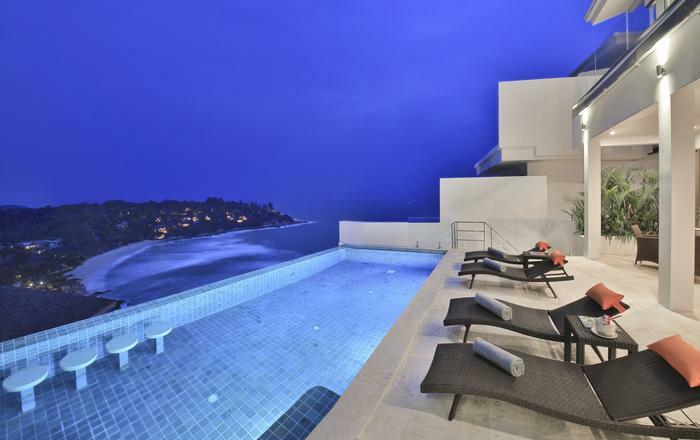 Start the day with a splash in your gorgeous L-shaped infinity pool. Just beyond, a white-sand beach and the dazzling blue ocean are laid before you. Or kick back in the poolside sala to your favourite tunes - piped through the sala's built-in speakers. Beyond, a beachside lawn is perfect for morning yoga. And with access to the villa's kayaks, you can explore the local seafront whenever the mood takes you. If you've still got energy to burn, squeeze in a workout at the shared on-site gym. Come together for group gatherings in an expansive living/dining pavilion with vaulted ceilings. Sip ice cold drinks while you unwind in the sitting area. A pair of cushioned sofas offer a comfy spot for chill-out time, and glass doors let you stroll straight back to the pool. Discuss the day's adventures at the solid wooden dining table, or enjoy outdoor dining in the covered sala. Ask the chef to treat you to a seafood feast while the sun fizzles into the ocean. 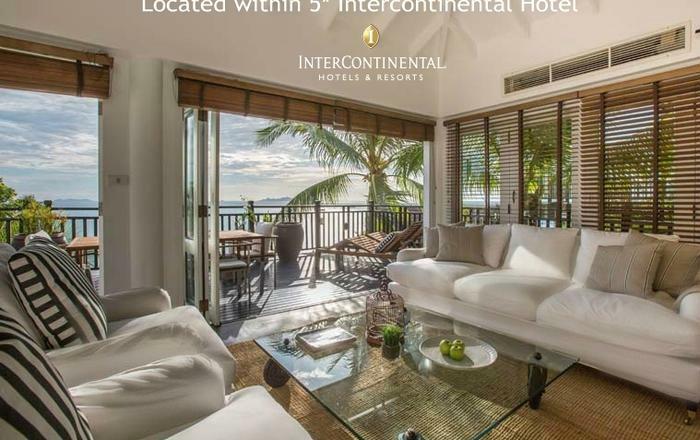 Five tastefully furnished bedrooms each feature ocean views, vaulted ceilings, and Thai-inspired decor. And everyone gets their own en-suite bathroom with marble floors, and indoor and outdoor showers. Three of the bedrooms have two twin beds, and a fourth bedroom comes with a double bed. In the spacious master bedroom, you can step out of bed and straight onto your private beachfront veranda. Sip morning coffee from a sun lounger or an inviting double daybed. 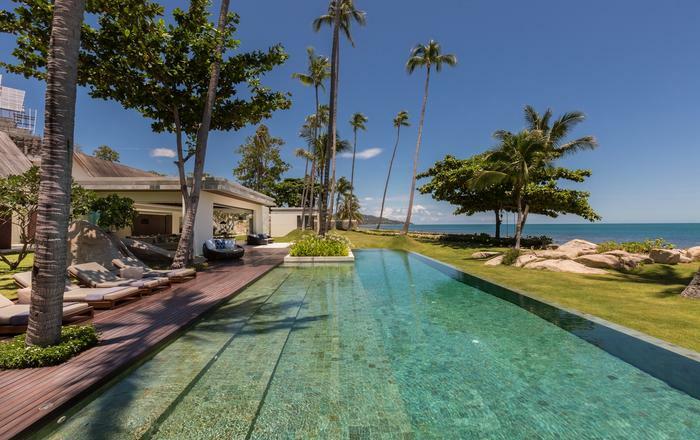 Located on Koh Samui's north coast, this luxury villa is one of just 8 exclusive properties in a private tropical haven on Maenam Beach. Take a morning run along the pristine strip of sand waiting just steps from your door. Or drift along the coastline in one of the villa’s kayaks. The sea here is also great for year-round swimming. Just over a 10-minute drive away, Fisherman's Village offers local restaurants, shops, and a popular Friday Walking Street Market. While 20 minutes away, Chaweng (Samui's buzzing resort town) is packed with restaurants, shops, bars and nightlife. Golf lovers are under a 15-minute drive from the 18-hole championship Santiburi Golf Course. We are a group of 7 friends who celebrated 50th birthdays of two of friends at this villa in a span of 2 years. In 2015 when we visited this villa for the first time we had a whale of time and had some awesome memories to cherish for life time. As one of our group member was hitting 50th this Sept, the search for party destination begun 6 months back, traversing around the globe with multiple location we could not but select Water Lilly Villa at Miskawaan because of couple of simple facts outlined here under: Serene and Beautiful villa located right on the beach. Excellent Staff!!! Always smiling and ready to help and serve at what ever hour!! All rooms, kitchen and over villa facility are avant-garde and cannot complain for anything. Neat, clean, spick and span villa. Before we get up in the morning after partying till late hours, Villa is picture perfect, neat and clean. Swimming pool is an simply amazing with a nice gazebo and bar over looking beach for sunset. I have been world traveler and have visited several beach destinations round the globe. I can say Miskawan Water Lilly Villa is one of the best. The villa is so beautifully and tastefully designed, well equipped and the staff is so good that you can ask for anything and they will bring it for you probably moon also!! In particular Poi the head staff was excellent, very courteous and always smiling and ready to make your stay as comfortable as possible. Her subordinates were equally very cooperative and supportive, at no point of time you felt that privacy was being invaded. I would recommend every one , family, couples, bachelors or bachelorettes to consider this villa for their stay at Koh Samui. We had an amazing time and wished we could have stayed at the villa a bit longer and have thought about returning at some point. Almost all of our guests commented on the villa and said we should have booked them all in to stay at the villas too. The staff were all wonderful especially Tim our villa manager and Sarah, our wedding planner. We has 35 guests and they all had a wonderful time at the cocktail night and enjoyed the food made by the villa chef. She cooked the meal for our wedding too and it was spectacular. Overall it was a brilliant experience and we would recommend it to all our family and friends. Would love to be able to go back there and spend some quality time as it was quite hectic for us in the run up to the wedding. Estate Fitness Centre 5 Minutes Walk Away. 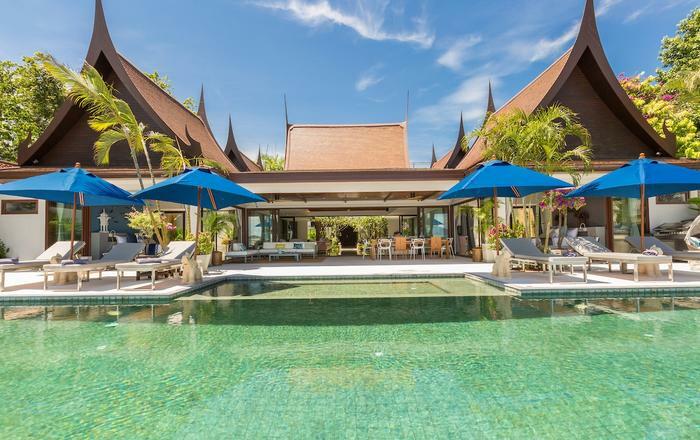 One airport transfer each way, live-in staff, a daily breakfast, a Thai chef with food costs on guests account, concierge service and English speaking villa manager.